Listen carefully and you may be able to hear the sound of tiny voices singing a little sweet tune from the reels of easyslots.com. 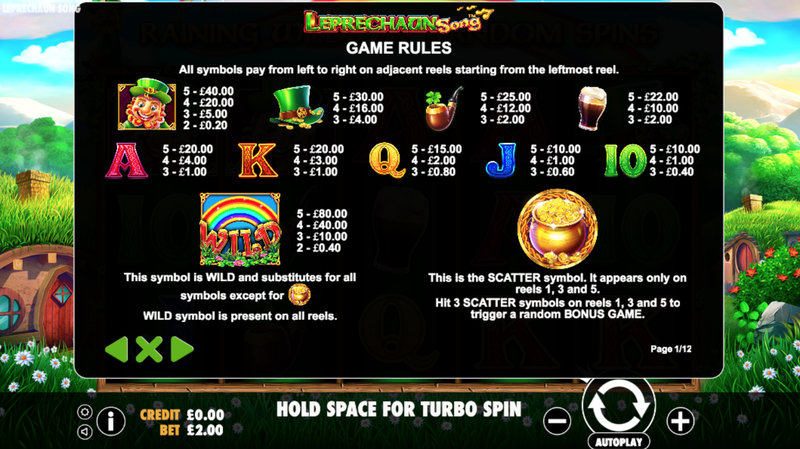 Leprechaun Song is a 5 reel, 20 payline slot with a lucky Irish theme. You're invited for a pint of Guinness with the tiny leprechauns who live in a small meadow at the bottom of an old Irish town. After a couple of pints, the leprechauns will start to sing and will hand out cash if you're lucky. The design is fairytale-like with rainbows, fluffy clouds, and small houses hidden beneath the grass. This magical land is not just home to leprechauns but is home to fairies, goblins, and elves too. 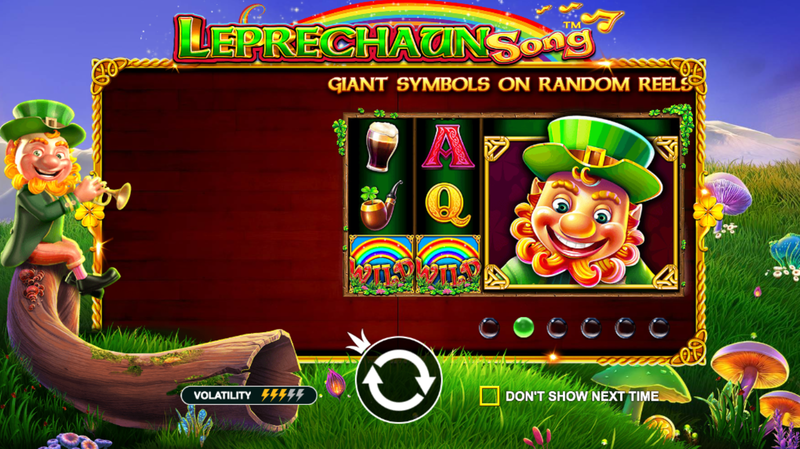 Leprechaun Song comes with an incredible set of luck-filled features including a pick a fiddle feature, giant symbol feature, and raining wilds feature. Experience the luck of the Irish with Leprechaun Song, a 5 reel, 20 payline slot created by Pragmatic Play. You'll get to explore and discover more of the little leprechaun village where leprechauns drink beer, dance the Irish jig, chase rainbows, and dig for gold all day. Behind the reels, you'll see the leprechaun village. In the distance, you can see mountains and a forest filled with trees. The leprechaun village is hidden behind the forest in a sweet little meadow where their homes are surrounded by daisies. Symbols include a pint of Guinness, a pipe, lucky four leaf clover, golden coins, and a leprechaun. The Wild Symbol - The wild symbol in this slot is the rainbow. This substitutes all symbols on the reel bar the scatter to create winning combinations. Landing 3 wilds will award you 5x your stake, landing 4 will award you 20x your stake, and landing 5 will award you 40x your stake. Landing 3 or more wilds also unlocks one of three additional features. Raining Wilds Feature - Wilds will rain onto the reels creating exciting wins. Pick a Fiddle Feature - You will be shown a set of fiddles here. Choose one to reveal a cash prize. Giant Symbol Feature - A large 3x3 symbol will appear on the reel creating a huge win. Bonus Game Feature - Trigger this feature by landing pot of gold scatters on any of the odd-numbered reels. Once unlocked, you'll be given 10 free spins and a 2x multiplier. You will then be shown a set of mushrooms. Choose a mushroom to reveal a multiplier or free spins prize. Pragmatic Play is one of the most popular online casino operators in the entertainment industry. All of their games are filled with incredible and creative concepts following the latest trends, new technology, great audio, and beautiful HD graphics. If you're feeling lucky, an Irish-themed slot is perfect. 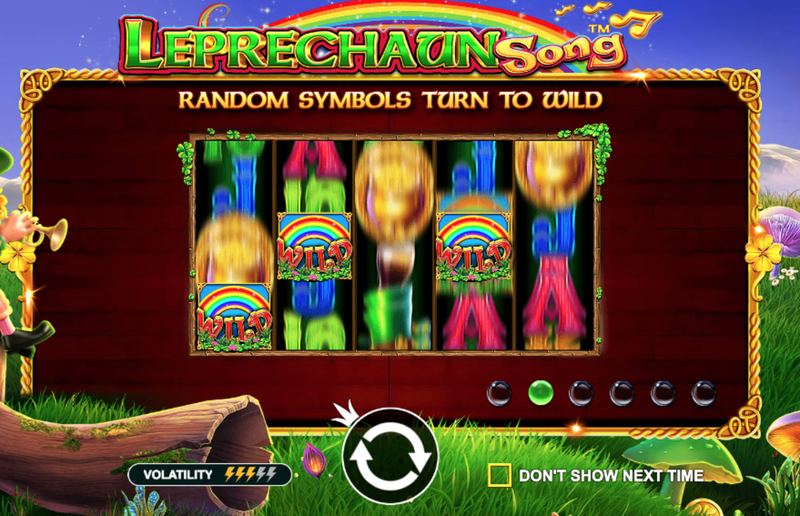 Leprechaun Song is a great Irish-themed slot with a beautiful fairytale-like design with lots of rainbow colour and magic. You can unlock lots of great bonus features by landing 3 or more wilds. All of these bonus features are entertaining and provide some very exciting multiplier, free spins, and instant cash prizes. Head to easyslots.com for some more Irish luck!